AMC will be applicable from the day of device upgrade to L0 level and shall be paid immediate after device upgrade. Standard fulfilment timelines offered is 2 – 4 weeks from the date of PO with complete details of delivery locations. Please mention the Name, Address, Phone number, Mobile Number and Email id of the concerned Official/Person on the purchase order; for each PO released so that any notifications can be addressed to the concerned official. Offer Validity: 4 weeks from the date of the Release of Quotation. Available output formats include RAW, ISO 19794-4 or WSQ compressed (under license) images. 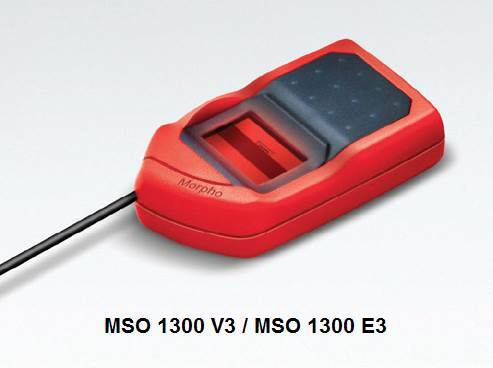 The MorphoSmart™ 1300 Series (or MSO 1300 Series) is a range of compact biometric USB devices. They use Morpho’s patented optical technology and fingerprint algorithms, both acknowledged worldwide for their high levels of performance and their exceptional robustness. Morpho fingerprint technology is ranked #1 by NIST for accuracy. We selected optical technology for our sensors as it has significantly more operational and accuracy advantages compared with other technologies. Lessons learnt from real world deployments put into practice Mechanical/visual guides ensure intuitive finger placement Interfaces display key information to help users: live image, messages (position, pressure etc.) and fingerprint quality score. Other, smaller sensors, allow different areas of the same finger to be presented with each placement, leading to poor data acquisition, narrow areas of overlap and matching errors. While most sensors on the market are only capable of producing fingerprint images, the MSO 1300 Series devices are also capable of processing them internally, running powerful algorithms directly on their embedded processor. To buy please email to info@ampletrails.com or fill the following form. When sensitive data (image or template) needs to be shared with a Host System, the MSO 1300 Series devices are capable of securing them before dispatching. Key derivation, Hashing algorithm, Random number generator, etc. 2 Image and Template Encryption for the sake of confidentiality. 3 Template Signature (X9.84 standard) to guarantee the origin and the integrity of the data sent to the Host System. 4 The communication channel between device and Host/Distant System can be protected using either Secure Tunneling or Offered Security mode. image that is certified PIV IQS by the FBI. The reference standard in terms of single fingerprint image quality (equivalent to ISO 19794-4:2011 Annexure B) was defined to ensure interoperability between multiple solutions. MSO 1300 E3 and MSO 1350 E3 detect a large panel of counterfeit fingerprint, including but not limited to those made with latex, gelatin, Plasticine, Kapton, transparent film, silicone, rubber, Play-Doh, graphite or paper.